Echosounders with performance adequate for fishing were not available until the 1930s and their size, power requirements and cost limited use to larger vessels. The principle is simple enough, all work by transmitting a pulse of sound downward to the sea bed and amplifying the echo to making it visible on a calibrated display. 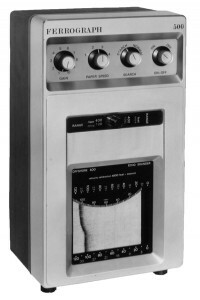 For about fifty years, a paper recording instrument was accepted as being the most suitable for fishing, as it set out the echo characteristics over time on a moving paper. We have one of the smaller types as a working example in our Wheelhouse Project, it dates from about 1970. With today’s equipment, paper has been replaced by a colour LCD presentation of remarkable clarity, but the pulse-echo principle remains the same. To optimise the detection of fish, the ultrasonic pulse is usually between 150 and 200 kHz and the pulse length is typically one tenth of a millisecond. As the speed of sound in water is about 1450 metres/sec the discrimination between echoes will be of the order of 140 mm. The top trace below shows fish just above the bottom echo, the marks below the bottom echo are from scattered sound and are more frequently seen when the sea bed is of a rocky nature. These effects are also visible when sounding near wrecks. The lower trace shows shoals of fish swimming well clear of the bottom, note that only the top layer of fish create the echo, fish will be packed closely inside the inverted V shape. Another characteristic of sound in water is that attenuation increases with frequency and for that reason the above echo sounder would not be used in deep water. 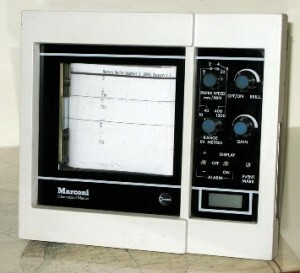 The Marconi echo sounder shown right operates at 24 kHz and can work down to 1200 metres using a relatively long pulse length of one millisecond. However, it takes about 1.6 seconds for sound to travel a depth of 1200 metres and return an echo, hence the process is relatively slow in deep water. For this reason there are controls on the instrument panel so the user can adjust the settings to suit the depth of water under the fishing vessel.